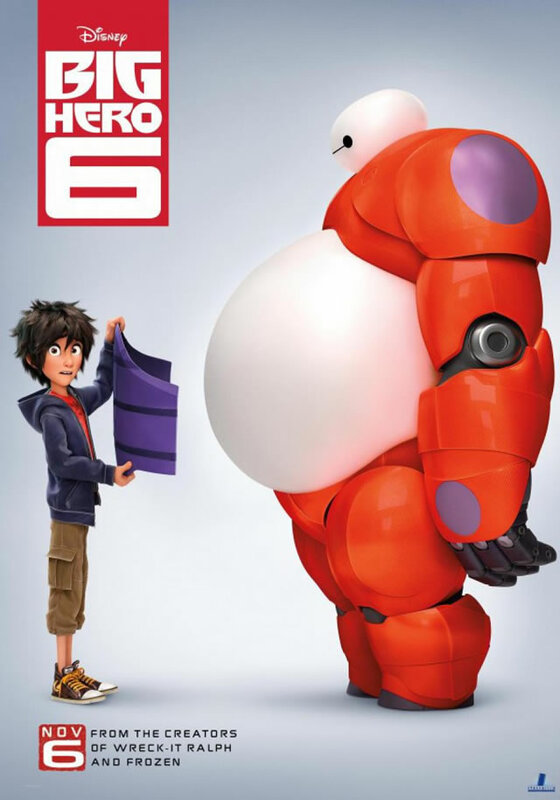 Big Hero 6 is the latest film from Disney Animation, loosely based on a relatively unknown series from Marvel Comics. Right off the bat this collaboration sounds like a dream film for families around the world. You have the makers of Frozen and Wreck It Ralph dabbling around in the house of the Avengers. Having so much to live up to, does the film hold up compared to the big films that have come before from both sides of the fence? Luckily the answer is yes, mostly because of the lovable robot you will become infatuated with, Baymax. Hiro Hamada is a young fourteen year old genius that is bursting with potential, but instead of putting that to use, he squanders it in back alley, illegal robot fights. His equally intelligent brother Tadashi hates seeing his brother wasting his natural talents in illegal pursuits, so brings him to the school he attends to show Hiro around in the science lab he works in. There Hiro meets several other geniuses, the hard-edged Go Go, the high-spirited Honey Lemon, and the or control freak Wasabi, all named by the slacker school mascot, Fred. Tadashi also introduces Hiro to his creation, a personal medic robot, Baymax. Seeing the wonders of the science lab, this spurs Hiro to try to get accepted to the school. With an upcoming student schowcase, Tadashi convinces Hiro to create a design to impress the teacher who could help him get admitted, Robert Callaghan. Indeed Hiro creates something wonderful in the form of thousands of nano-bots that can come together to perform virtually any task the user commands. Of course it does not take long for Hiro’s invention to fall into the wrong hands, leading him to upgrade his brother’s robot Baymax, along with his new friends into full-fledged super heroes. The team that eventually makes up Big Hero 6 are all each interesting, having their own little quirks that make them interesting in their own right. Of the human component, Fred is the highlight of the cast. He is a lovable slacker who lives for the world of comics and cannot be happier when he and his friends get attacked by a villain and become super heroes themselves. Not only that, but quick eyed viewers will see during the film he has the biggest connection to Marvel, something which gets played for huge applause and laughs in the after credit scene. The rest, even Hiro himself, are still each enjoyable in their own ways, but get outshined by the biggest draw the film has, Baymax. Which that is where the film stops from being a perfect outing. If the film only focused on Hiro and Baymax without the other heroes, it would have really been for the better. Their relationship is really the heart of the film, Hiro finding himself the originally reluctant, almost father like figure, friend to this robot who has no understanding of the human interactions. As the film nurtured their friendship throughout the film, you cannot help but smile and cry with them. The film takes some of the best aspects from Disney Animation and Marvel to meld them together into an excellent story that will have you leaving the theater more than satisfied, if not already craving a sequel giving us more Baymax. If the series does bring us a sequel, the real challenge will be to try to give us more of the team and have us care about them as much as we do about a giant robot. Otherwise the film is sure to please comic book fans and have you laughing long after you leave the theater.